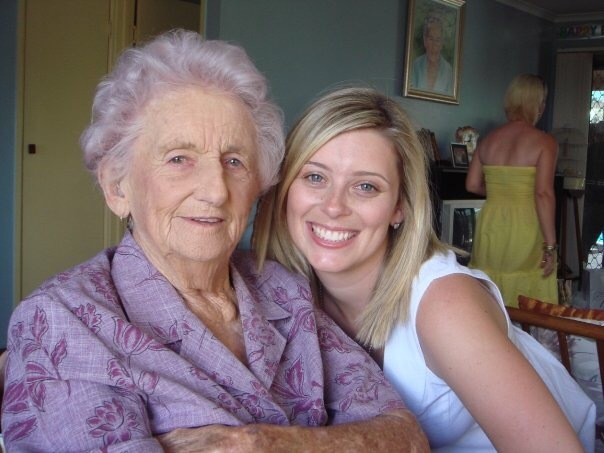 Yesterday marked 100 years since my Nana was born. It is strange to think she was born an entire century—and how much change (for better and worse) she had seen in the world throughout the 92 years she lived. To those who knew her, Bernice Falvey was a magnificent woman. For those who didn’t, you missed out on someone who could bring tears to your eyes and joy to your soul with her quick wit and sharp tongue. And then there was her baking; apple pie, pikelets, lemon butter and peanut cookies topping my list of favourites. Her eyes sparkled with mischief and love, and she is missed dearly (even if she did jinx me by saying I shouldn’t get married until I’m 40 and call me ‘roly poly’ when I came home a little chubby from the Heathrow injection!). I came home from London for a few weeks in early 2009 to spend time with her and I was there when she died a few weeks later, another little piece of my heart forever broken. Later I was given the privilege of helping write her eulogy, which I re-read last night, remembering all the remarkable things she did in life and the lessons she taught us. No one can compete with her pickles. I’m fairly sure she stills holds (unofficial) title of Pickle Queen, having cooked up 600 bottles to help one of her granddaughters win the 1996 Miss Brisbane Fundraiser title at the Miss Australia Awards. Two bottles even made their way to Dolly Parton who (according to Nan) said they were the best she’d ever had. Always be ready to help others. Always one to lend a hand, Nana opened her home and helped with the clean-up efforts from the 1974 floods. With up to 16 extra bodies in the house, the washing machine and stove ran non-stop but it was the friends which stemmed from that experience which made it all worthwhile. Fundraise. Nana hosted sausage sizzles, street stalls and even took to the catwalk to raise money for her local church, St Frances Xavier in Goodna. Through her endeavours, and with the support of local residents and parishioners (who probably were not game to say no), the church was able to install its first set of speakers and pay off the $1000 debt on a car owned by the Sisters. St Anthony is the man. Nana had a great faith and it was her unwavering faith in St Anthony which led to his appointment as the patron saint of the Falvey family. Everyone still turns to him when searching for lost items or praying for a miracle, but as Nana taught us—we must always add “if it’s for the best” to the end of our prayers. The secret to a long life. When interviewed by the local paper for her 90th birthday, Nana said her secret to a long and happy life was hard work and staying away from cigarettes and alcohol, but I believe it was better attributed to the adoration of her family, her fondness for Mills and Boon novels and the 37 cruises she took throughout Asia and the South Pacific, most with her friend Charlie. Nana will always hold a place in my heart and I am truly thankful that I got to call such a remarkable lady my Nan. 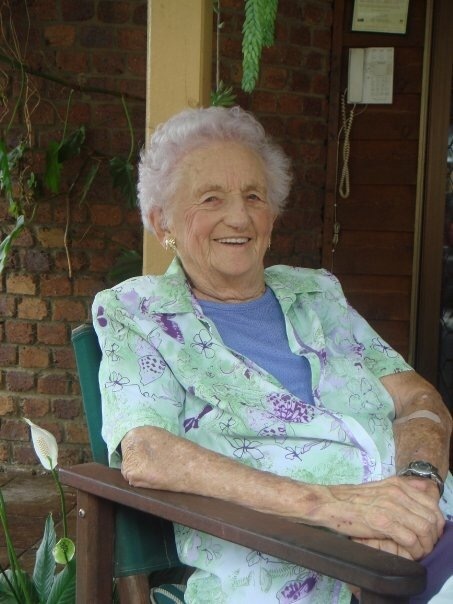 Bernice Falvey – 20 March 1916 to 8 February 2009. 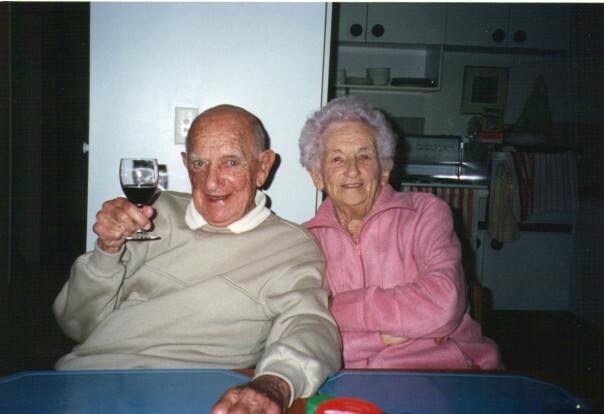 Charlie and Nana on holidays at Coolangatta. Women fart. Deal with it. Love this post. My grandma was like yours – everyone in the family’s hero, an amazing cook and, at the mere thought of thinking about how one in a million she was makes me well up. I can only hope my grandchildren one day will think the same of me. A lovely tribute, Brooke, to a grand lady.